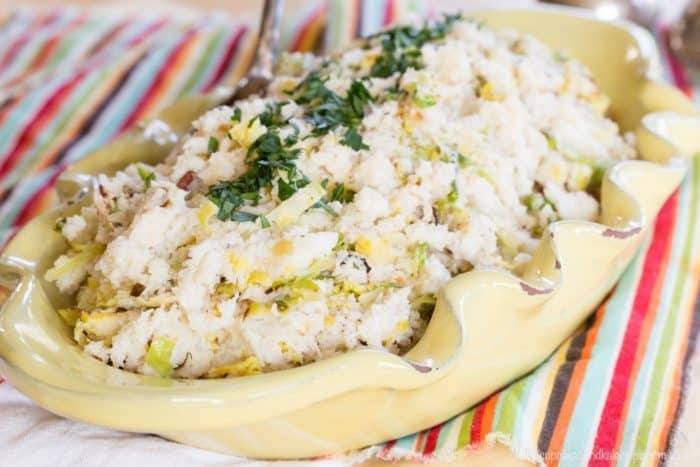 a low carb and veggie-filled twist on the classic Irish mashed potatoes dish, but flavored with the delicious pairing of bacon and Brussels sprouts. Try it for St. Patrick's Day! 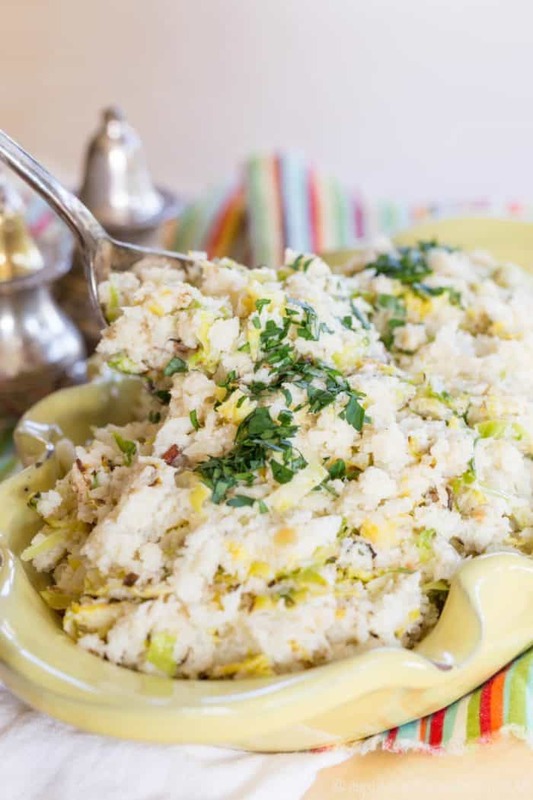 Cauliflower colcannon is a low carb and veggie-filled twist on the classic Irish dish. 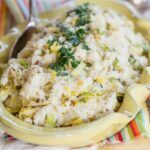 The traditional colcannon recipe typically consists of mashed potatoes with kale or cabbage, but this one uses mashed cauliflower instead, and it’s flavored with the delicious pairing of bacon and Brussels sprouts. 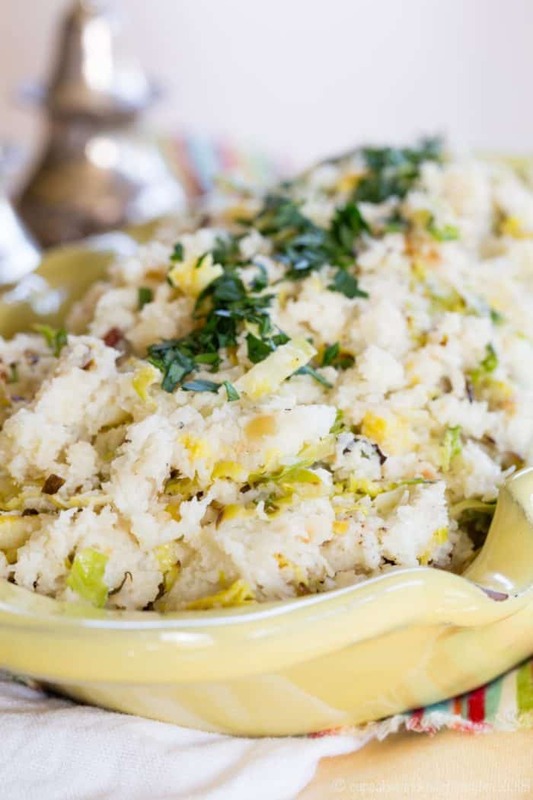 Celebrate a gluten-free St. Patrick’s Day by adding Brussels Sprouts Bacon Cauliflower Colcannon to your menu. And I don’t like lamb, so there you have it. 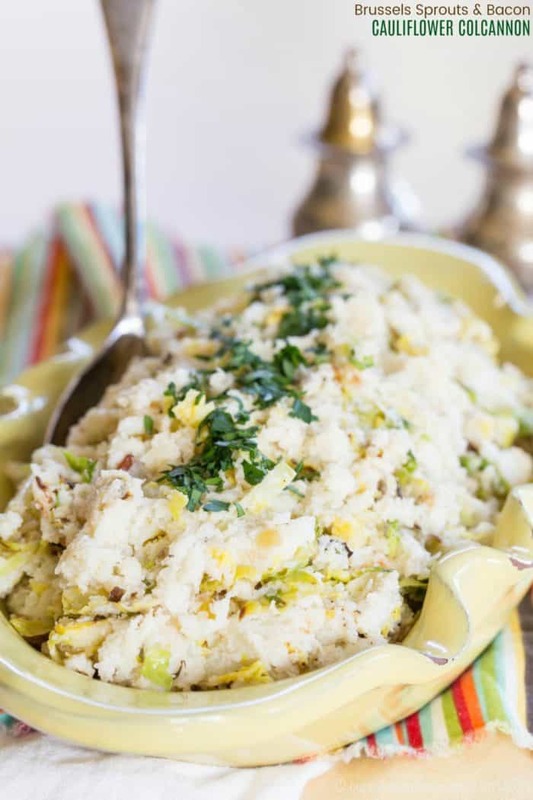 Brussels Sprouts Bacon Cauliflower Colcannon for a low carb St. Patrick’s Day side dish. Now I’ve done it, because not only did I pass the potatoes, but I cut out the cabbage too. Well, not completely. I really just replaced them with wee bitty little cabbages (also known as Brussels sprouts), which I just so happened to cook with some bacon before stirring them into the mashed cauliflower. And then I might have proceeded to eat the entire batch myself over the next couple of days because my crazy husband and kids are anti-Brussels sprouts. Too bad for them, because it was incredibly delicious. I didn’t make this batch as smooth as my Horseradish Cheddar Whipped Cauliflower, but I love the more homestyle texture, and the the flavor combination of the salty, smoky bacon with the cauliflower made creamy with just a bit of butter and Greek yogurt was absolutely perfect. I’m totally going to be enjoying it with my Easy Slow Cooker Corned Beef for St. Patrick’s Day this year! 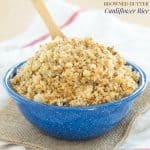 I do use hard cider in that, so those that are on the keto diet might not be able to make that exact recipe, but it is a delicious gluten-free alternative to cooking it in Guinness. But for a low carb version, try this Pressure Cooker Corned Beef with Creamy Horseradish Sauce from Kalyn’s Kitchen. 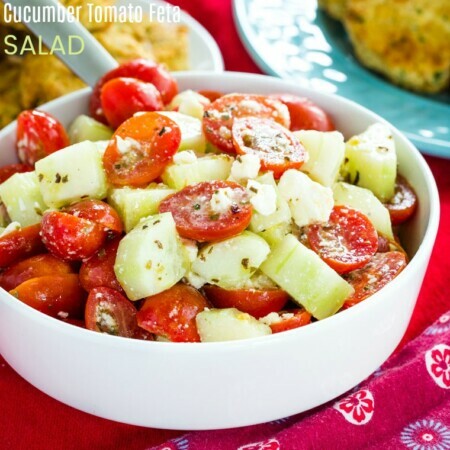 Serve it alongside Low Carb Irish Soda Bread Muffins from Sugar Free Mom. Then finish off the meal with Low Carb Irish Cream Brownies from All Day I Dream About Food. Have I convinced you to make Brussels Sprouts Bacon Cauliflower Colcannon yet? 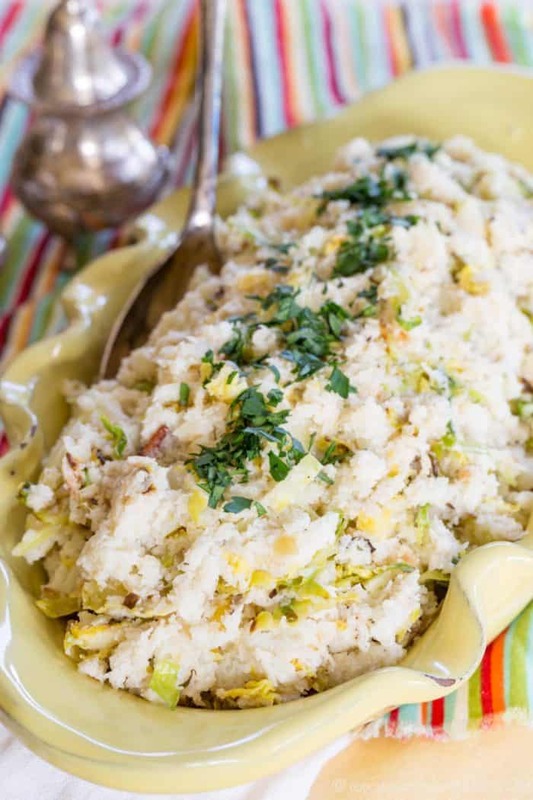 Yes, now you probably want to know how to make Mashed Cauliflower Colcannon with Bacon and Brussels Sprouts. 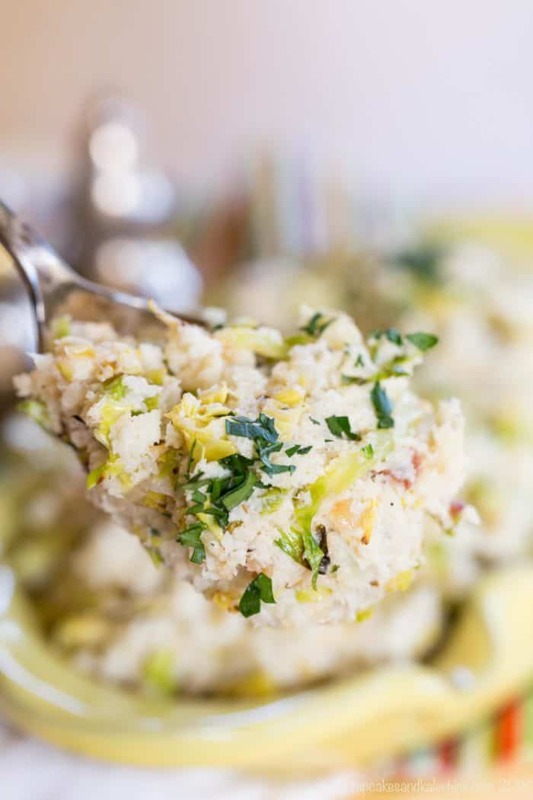 My friend Becca from It’s Yummi told me about this Cauliflower Colcannon recipe from Divalicious Dishes, and knowing my love of all things cauliflower, we knew I had to put my own spin on it. I don’t use a lot of heavy cream in my cooking, so decided I wanted to try it with Greek yogurt, and then I just couldn’t resist the combo of bacon and Brussels. You’ll start with one medium sized head of cauliflower, and cut off the florets. 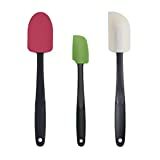 You should end up with about 7-8 cups, but if you have more, you can just add a little more yogurt or butter to achieve your desired consistency. Then just steam it until it’s super soft. Then you’ll take your Brussels sprouts, cut off the bottom of the stem where it is brown, remove any yellow or otherwise damaged outer leaves, and cut it into shreds as if you were cutting cabbage for a slaw. Cook some bacon, add a little onion and then the Brussels sprouts. Then it’s time to mash the cauliflower. I started with a potato mashed, but I wanted it a little less lumpy, so decided to switch to my food processor. I alternated between pulsing and pureeing, stopping to scrape down the sides every once in awhile. This got rid of all the big chunks, but still left a nice, homestyle mashed potatoes texture, not a super smooth puree or whipped cauliflower. My initial plan was to use just Greek yogurt, but I found that a little knob of butter greatly improved the velvety texture and gave it a bit richer flavor, even without the heavy cream found in other similar recipes. 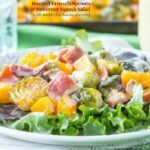 Then all you need to do is stir in the bacon and Brussels sprouts mixture and serve, though a little sprinkle of parsley adds a nice bit of color and freshness to your Brussels Sprouts Bacon Cauliflower Colcannon. Want to chat with fellow foodies? 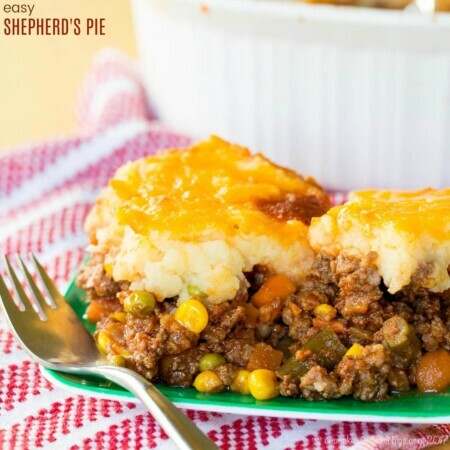 Join the No-Fuss Food and Fun group on Facebook to share recipes and ideas, ask and answer questions, and tell everyone what you’re making for dinner! Request to join HERE. Or sign up to have Weekly Sprinkles from Cupcakes & Kale Chips delivered straight to your Inbox! 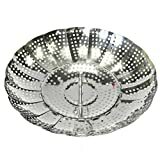 Fill a large pot with about an inch of water and place a steamer basket inside. Bring the water to a boil. Add the cauliflower florets on top of the steamer basket, cover with a lid, and steam for 10-15 minutes, or until very soft. While the cauliflower is steaming, heat a skillet over medium heat. Add the bacon and cook until crisp. Add the onion the the pan and saute for a minute or two, then and Brussels sprouts. Cook 5-7 minutes, or until tender. When the cauliflower is soft, remove the steamer basket from the pot and let some of the steam evaporate off of the cauliflower. Transfer the cauliflower to a food processor, add the butter, Greek yogurt, salt, and pepper. Then puree to the desired texture, pulsing and stopping the processor to scrape down the sides as needed. Transfer the mashed cauliflower to a bowl and fold in Brussels sprouts mixture. Season to taste with salt and pepper, and sprinkle with chopped parsley, if desired. Adapted from Cauliflower Colcannon from Divalicious Dishes. Woah! 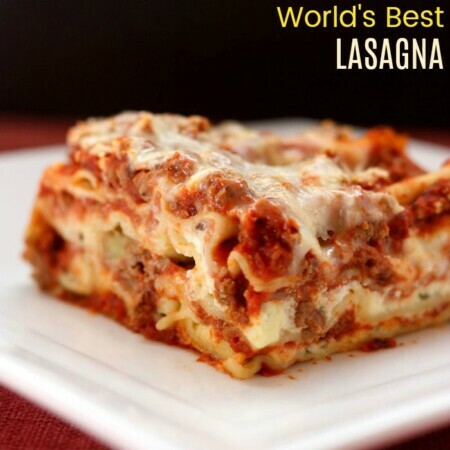 This low-carb recipe looks amazing and delicious. 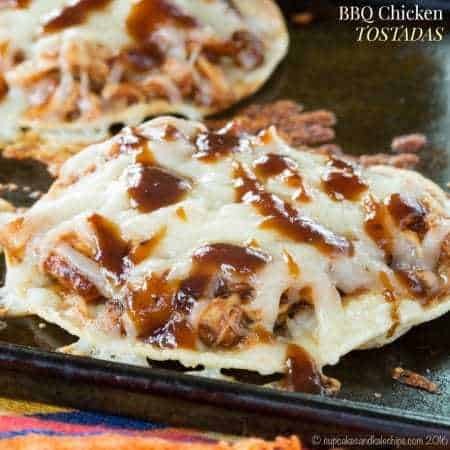 I would love to try this as soon as I have all the ingredients available. Thank you for sharing the recipe. Thanks, Shelia. 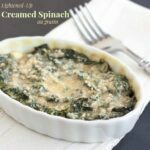 I hope you enjoy the colcannon! YUM! I would love that for St. Patrick’s Day! And thanks for the shout-out for my pressure cooker corned beef. Of course I am making that again this year! Your recipe looks amazing, Kalyn!